Across the Seven Kingdoms of Westeros, ravens carry tidings of the change of seasons. Summer is ending. Winter is coming. 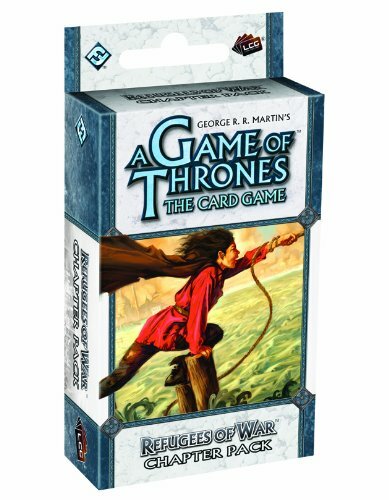 Seasons have powerful impact on the world of A Game of Thrones: The Card Game. Dozens of characters and attachments gain strength during Summer's bounty, and dozens more find themselves better suited to Winter. With its seasonal agendas and other cards, the A Time of Ravens cycle has long had a far-reaching impact on A Game of Thrones: The Card Game. Refugees of War is the fifth installment of 60 fixed cards for the A Time of Ravens cycle. The only thing worse than a long winter is a long winter of war. Brutal cold, starvation, and relentless conflict have created refugees from many of the common folk of Westeros. Now the Houses must prey upon the weak or pray to survive.